LAGOS – The Committee to Protect Journalists joined more than 15 rights organizations and the #KeepItOn Coalition to call for Nigerian authorities to ensure that internet and social media services remain connected during upcoming elections and safeguard internet speeds of websites and messaging applications. In early February, Nigeria’s federal government denied rumors of plans to shut down the internet during upcoming elections, according to the privately owned Guardian Nigeria and Quartz news outlets. Nigeria has two sets of elections including the federal elections on Saturday,February 16 and state elections on March 2. The letter, addressed to Umar Garba Danbatta, executive vice chairman and chief executive officer of the Nigerian Communications Commission, emphasized how internet disruptions inhibit journalists’ ability to safely conduct reporting and run contrary to international law. It also highlighted additional social and economic costs of internet outages. “The media is critical to this particular election and critical to people understanding both the [election’s] processes and procedures,” Festus Okoye, national commissioner of Nigeria’s Independent National Electoral Commission, told CPJ on February 13. Okoye also emphasized the importance of internet connectivity because the smart card readers used for voter identification are based on the internet. “Three networks–Glo, MTN, and Airtel–are powering them [the smart card readers], so if you jam the network there won’t be any election…that’s just the bottom line.” he said. Access to information and freedom of expression are pillars of a democratic society and are essential during elections. Millions of Nigerians like many more around the world depend on the internet to find their polling stations, identify and engage with election campaigns, listen and vet candidates, use the information they gather online to cast their vote, and use the internet to report misconduct during the elections. After the election, Jonathan willingly conceded his defeat to Buhari, becoming the first sitting president in Nigeria to do so. Despite Buhari’s flimsy democratic credentials, this peaceful transfer of power, coupled with the new president’s initial successes in the fight against corruption, convinced many Nigerians that they had made the right choice. For a short while, many Nigerians believed that they may not be forced to choose “the lesser of the two evils” in future elections. However, only four short years later, Nigerians preparing to head to the polls on Saturday once again found themselves between a rock and a hard place. This time the choice is between Buhari, whose time in power has only served to embellish his unsavoury reputation, and Atiku Abubakar, a former vice president whose campaign has been undermined by repeated allegations of corruption. Buhari’s term as president started on a high note. He won himself numerous admirers by arresting and prosecuting several corrupt former public servants. Most prominently, only months after assuming power in May 2015, the Buhari administration ordered the arrest of former National Security Adviser Sambo Dasuki, who was accused of overseeing the frittering away of $2.1bn that should have gone into bolstering the army’s arsenal againstBoko Haram. Back then, the public was optimistic about the new president’s potential and the masses were willing to give the new administration some leeway to “fix things”. Even a petrol price increase, which usually leads to nationwide protests, was largely accepted by Nigerians as a necessary move to help revive the country’s ailing economy. But soon things started to unravel. It didn’t take long before it became obvious that the Buhari administration’s anti-corruption campaign was only targeting the opposition. Not only did the new president overlook criminal/corrupt elements in his government – including Babachir Lawal, Secretary to the Government of the Federation and Finance Minister Kemi Adeosun – his party, the All Progressives Congress, gleefully welcomed several opposition politicians facing corruption charges who chose to defect to the ruling party. Moreover, when Buhari finally started to form his cabinet after six months in office, his choices made his suspected bias towards the north undeniable in the eyes of many Nigerians. On top of all this, the president failed to kick start Nigeria’s failing economy during his time in power, with the Naira further depreciating, numerous companies folding up and unemployment reaching further heights. Buhari’s health problems also raised some questions about his fitness for office. The president spent 103 days of his first term receiving treatment in the UK. This could have been excused and forgotten as an extraordinary misfortune, but the 76-year-old continues to be betrayed by his frailty and senility to this day. He repeatedly makes mistakes, such as presenting party flags to the wrong candidates or mixing up the dates he came to power, which make him appear confused and powerless, affirming suspicions that he may not be “the real leader” of the Nigerian government. In December 2018, his wife Dr Aisha Buhari added fuel to these suspicions by claiming that the Buhari presidency has been highjacked by a cabal. In most democracies, embattled incumbents like Buhari, who had failed on multiple fronts, do not expect to get a second term. However, Nigerian voters seem to be inclined towards choosing known devils over unknown angels, so the incumbent president is still a frontrunner in the upcoming presidential election. And the man being touted as the only real alternative to Buhari, former Vice President Atiku Abubakar, is another figurative “known devil” who comes with equally weighty baggage. Clearly, neither Buhari nor Abubakar offers all-around hope for the long-suffering Nigerian masses. 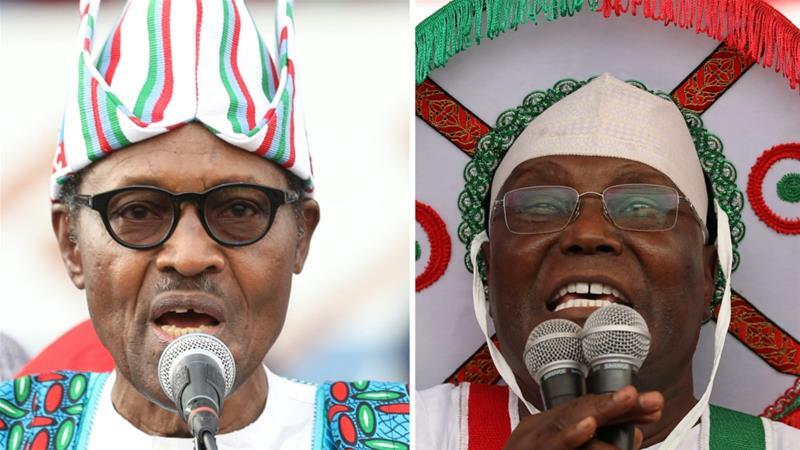 However, despite the availability of some credible alternatives – including activist Omoyele Sowore and economists Kingsley Moghalu and Tope Fasua – the only real contenders in the upcoming presidential race appears to be these two septuagenarians. Nigerian voters’ inexplicable reluctance to give a chance to fresh faces and new ideas is the main reason behind this hopeless dilemma; however, less experienced candidates who failed to enter the presidential race in time and convince the masses that they can stand up to seasoned politicians like Buhari and Abubakar also share some of the blame. Nevertheless, it is now clear that Nigeria’s democracy will be the main loser of Saturday’s presidential election. Whoever wins the race will be scoring a victory not for the Nigerian people, but for their army of political and personal hangers-on. The Nigerian people can expect to “win” in a presidential election only if they refuse to choose the “lesser evil” and commence the process of building a virile alternative political force.